The wellness movement, believe it or not, is still in its relative infancy. Yet, in the last few years, the global wellness market has exploded into a $4.2 trillion industry. We already have smart tech wearables, so the next wave of this movement is shaping up to take more of a holistic view of health and lifestyle, going beyond step-tracking to helping us feel happy, stimulated and at our best. Wellness tourism is emerging big time, with an influx of hotels featuring rooms designed for optimum well-being and stress relief. This alone has grown at a rate of 14%, compared to the overall industry’s 6% growth. Companies are also consciously looking for ways to incorporate wellness into their events and meetings beyond the usual offerings of a morning group run, a yoga class and “healthier” food options. Extreme Optimization: As DNA-customization goes main stream, we’ll see hyper-personalized services emerge, including diets and home-food delivery based on at-home DNA testing with optimal food ingredients tailored to a customer’s blood type. This means that event participants will be heavily armed when it comes to knowing what they want to eat at our functions. Extreme Anti-Wellness: There is always a backlash when we cannot live up to such restrictive and limiting standards. Some consumers will reject the wellness movement with anti-diet activities like beer and pizza yoga. It’s true! This reinforces the new fact that one size is never again going to fit all and, more than ever before, no two attendees are going to want the same things. As event planners, we need to start thinking of unique, imaginative ways to integrate wellness into our live gatherings. The answer for those of us trying to please everyone all the time may well lie in creating “environments” in which guests can enjoy their own healthy behaviours. For example, a “club-soda” type event for the sober-curious. These have been inspired by places like Redemption, an alcohol-free bar in London, and Sober, a night-club event in Stockholm that gave rise to “sober raves” across the world. How about all-natural, healthy relaxation drinks served in a “tranquini bar,” a comfy-chic setting complete with essential-oil scent atomizers, chill music and handcrafted pots of thriving plants? Doesn’t that sound like a refreshing change to the overdone martini bar? Oh, those crazy Swedes – they are big into the whole clean-living party phenomenon. Have you heard of lunch beat? It’s quite simply a giant dance party that happens during workers’ lunch breaks, like this one. These lunch beat events are even corporately endorsed. Can you imagine how fun and engaging that would be for a conference or meeting break? 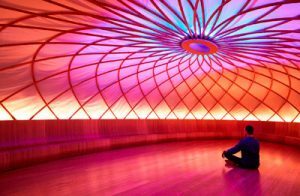 In the quest for wellness elements, consider yoga raves or meditation breaks in clean spaces with colour-therapy lighting replacing conventional lighting. You can also take a few lessons and ambience-setting tips from lifestyle philosophies like the hygge movement. “Hygge” is Danish for coziness and contentment. Or what about simply hosting a session outdoors, either seated or as part of a hike? While we’re at it, why not make a yoga class part of an evening event or pre-dinner activity? It is said that food really does taste better after yoga! Wellness of course goes beyond the physical. Without getting too weird or “out there,” I would be negligent in not mentioning the strong global emergence of spiritual wellness spaces and activity concepts. Full-moon parties and astro-lounge events are becoming quite popular and newly unique. Astrology, tarot and alternative spiritual therapies are also enjoying a resurgence at corporate events. This part of the wellness trend also speaks to an emerging obsession with the cosmos and space. So, when hosting events of this type, use the “universe” for visual inspiration and imagery, and try creating atmospheres based on the constellations. It’s clear that emotional well-being will become just as important as physical health and this rising demand can provide us with so many new event possibilities. May health and wellness be with you … and your event! Diane Julien, president of The Really Fabulous Event Co, has been creating event experiences in Canada for over 30 years. She has a keen knack for spotting trends and staying ahead of the curve. Her company provides inspired event design, planning and implementation services to corporate organizations and associations. Subscribe to e-news for great event intel delivered monthly to your inbox. Toronto's B2B site for event industry professionals and the place to connect with event planning decision-makers.